Don't Shoot! 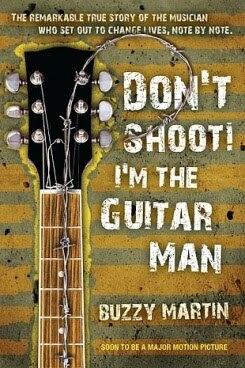 I'm The Guitar Man is a true story account of one musicians journey to bring music to those imprisoned in the San Quentin State Penitentiary. Written in a journal-like format, Buzzy Martin, takes you week by week thru his 3 1/2 years as music teacher at one of the United States worst criminal prison systems. With many thoughtful and sometimes, comical insights, Buzzy takes you on a ride thru his psyche and his struggles to teach those less fortunate by bringing a little music to their souls. Initially consigned to do a 12 week program, he quickly gains the trust of the inmates which takes him on a three year freak ride. From the lock downs, to the hostage situations, sexual advances and prison officers being beating up, Buzzy writes of what life is like on the inside of the Q. Buzzy talks of the "pecking" order of things and warns the children in his outreach programs about the dangerous and soul-sucking madness that goes on behind the walls of the prison. He explains much about prison life and backs it up with statistics and historical references. He talks about the different wards or blocks in prison and the character of the people who are incarcerated there. I quite enjoyed reading this book and cannot wait to see it in a motion picture. It was a quick and easy read with mild to moderate expletives and many sexual references. A true story about a musician who brings a common language to the prisoners of San Quentin State Prison and shares his experiences along the way.